“I can’t remember when I didn’t believe in the gospel,” says Quentin L. Cook, who believes that, paraphrasing Harry Emerson Fosdick, “when you pick up one end of the stick, you pick up the other end also.” Early in his life, he took hold of the gospel, and his testimony has driven his life’s commitments ever since. Born in Logan, Utah, on 8 September 1940, Quentin was one of three children born to Bernice and J. Vernon Cook. After Quentin’s mission to England from 1960 to 1962, he married his high school sweetheart, Mary Gaddie, in the Logan Temple on 30 November 1962. 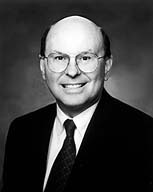 He graduated from Utah State University in 1963 and from Stanford Law School in 1966. As residents of Hillsborough, California, and the parents of three children, the Cooks immersed themselves in family, church, career, and community. For Elder Cook, commitment to career resulted in 27 years as a business lawyer and three years as president of California Healthcare Systems. Commitment to community led to 14 years of volunteer service as a city attorney. Commitment to church resulted in 15 years in the San Francisco Stake presidency and service as a regional representative and later as an Area Authority in the North American West Area. “In my life, picking up one end of the stick has meant commitment to picking up the other end also,” says Elder Cook, whose early but firm grasp of the gospel of Jesus Christ has resulted in a life of good works and a commitment to future service as a Seventy.